The Italian fashion brand MUSIC and SONS address some clothing issues with thier T-Shirt collection. The first problem they address is the wire management in our electronic devices by integrating headphone wires seamlessly into the T-Shirts. MUSIC and SONS is also using naturally sustainable materials like BAMBOO in their products. This natural fiber is hypoallergenic, absorbent, and is naturally anti-bacterial so it will not hold odor. It also is the most sustainable of the natural fibers, reaching a mature height of 75 feet in just 45 to 60 days. And, because of its natural antibacterial properties, it needs no pesticides. ORGANIC COTTON plays a big part in MUSIC and SONS T-Shirt collection as well and only 100% pure organically grown cotton is used. Last but not least, all T-Shirts are hand printed by using eco-friendly water based screen print for a very soft touch. We got word that MUSIC and SONS is launching very soon a new collection of T-Shirts, adding for the first time a long sleeve version (see above) and a new accessory line comprising a Unisex Organic Knot Hat and a Black Music Bag. 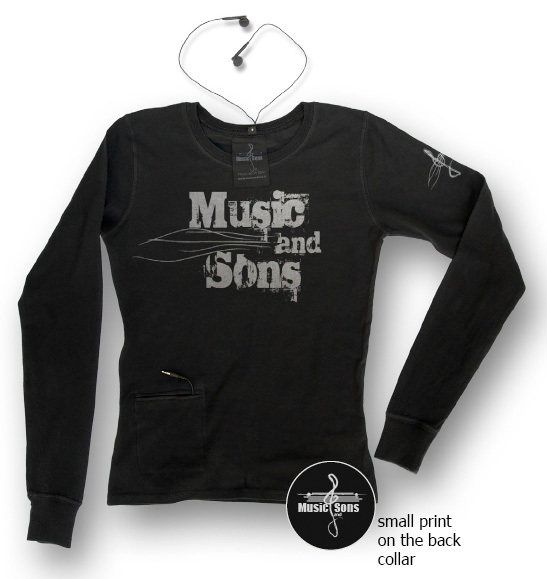 Rock the MUSIC and SONS music T-Shirts and be in the most environment friendly threads available.